Whether you’re a tenderfoot or a trekker, state parks offer nature walks to soothe the soul. Everybody wants an adventure, and you can have one today. It’s an adventure for young or old and will cost you next to nothing: Go for a walk. The state parks of Texas are full of them, from easy strolls to rugged ramblings to strenuous hikes. Whichever you choose, every walk is an adventure. Even if you walk the same path every day, it’s never exactly the same. You encounter different weather, different people; you notice different things; you have different thoughts; your body reacts differently. Your walk can be the adventure of your day. We humans walk upright on two legs. We don’t run everywhere we go, we don’t amble on four legs like most mammals, and we don’t use our knuckles on the ground for balance like other primates. We don’t have a tail to aid in jumping like a kangaroo, we don’t swim like a dolphin, and we don’t crawl around on our bellies like a reptile. We walk at a leisurely pace, around 2 to 3 miles per hour. We may spend the majority of our week bound to a desk at work or school and much of our leisure time in sedentary pursuits like surfing the Internet or watching TV. We can pull our weight, climb every mountain or paddle our own canoe. But none of that is what we’re made for. We are made for walking. Walking is good for you. Research has shown that walkers live longer, are stronger, feel better, sleep better and remember more than nonwalkers. Unlike nearly everything else in our society, walking costs nothing. Considering all of the benefits you will reap from a nice walk, it’s the biggest bargain you will ever have in your life. No amount of wealth can buy the freedom, health, independence and clarity of mind that walking provides. Here are some of the best walks in our state parks. 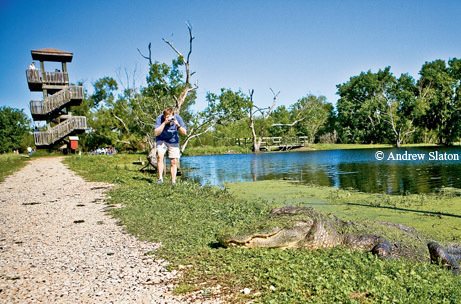 Only 28 miles southwest of Houston, Brazos Bend State Park is a nature lover’s dream. It’s isolated from the big city, and you can spy many types of wildlife, including a large number of alligators and many species of birds. You can also take a peek at the heavens at the park’s observatory. The 1.25-mile 40-Acre Lake Trail is a perfect place to take children — it is nearly impossible to be bored here. The trail follows the banks of a shallow, marshy lake and offers views of different aquatic habitats. At the southern end of the trail, near the parking area, is an observation deck that juts out over the lake. At the northern end of the loop is a four-story observation tower that offers commanding views. Almost any time you stroll around here, you’ll see wildlife, whether it’s egrets posing, ducks swimming, bobcats scooting or alligators out for their own walk. The gators are so abundant, the park has signs up with instructions on how to coexist happily with them. If you’re intrigued by the alligators, go in the morning, because this is when they’re basking and easy to see. That low thrumming you hear in the spring and early summer on your walk? Those are the gators. Who doesn’t like dinosaurs? The first thing you’ll see at Dinosaur Valley near the town of Glen Rose are two huge ones — a 70-foot apatosaurus and a 45-foot Tyrannosaurus rex. While these may be fiberglass replicas, the real things left their footprints in the mud some 113 million years ago in what is now bedrock in the Paluxy River. To a scientist, the tracks even tell a story: A carnivorous dinosaur is stalking a much larger plant-eating dinosaur, just like the replicas by the park gift shop. The park provides illustrations at the track sites to help you pick the footprints out. Along this 1.5-mile walk you’ll amble along the same path as those dinosaurs did long ago. The River Ecology Trail begins at Track Site 2 and follows the bank of the river to a park campground. The trail is paved and is open in some places and winds through thick stands of cedar and oak in others. When you get to the campground, return to the Site 2 parking lot by taking the short trail at campsite 35 by the amphitheater. The landscape around Jacksboro is typical of the eastern edge of the Panhandle: relatively flat and unexceptional. But Fort Richardson is gorgeous. It has a small lake near park headquarters and several nice walks. The easy half-mile trails that take you alongside the creek are a delight. The Lost Creek Nature Trail is beautiful, with carefully carved stone steps. It goes through thick stands of oak, punctuated with prickly pear cactus. You’re only a stone’s throw from the creek, though it is sometimes lost in the dense oaks. If the weather is warm, step over and soak your feet and look for the critter tracks of rabbits and raccoons that have done the same thing before you. You can make this a loop, adding about another half-mile, if you return along the Rumbling Spring Path that follows the opposite shore of the creek; you’ll have to walk along the paved park road for the last quarter-mile. The Rumbling Spring Path is more rustic than the Lost Creek trail, rewarding you with a different perspective. Leaf peepers and bird watchers love the Maple Trail in the fall, but this is a great walk any time of the year thanks to its remote location five miles north of Vanderpool, out in the far western edge of the Hill Country. The Maple Trail follows along one bank of the Sabinal River, while the East Trail follows the other. The Maple Trail cuts through thick stands of maples and is secluded, with varied terrain, large boulders and hand-hewn rustic steps and railings. Don’t be in a rush — take a break at a bench under the tall maples and listen to the birds singing, the river burbling over rocks and the rushing of the wind. When the Maple Trail ends, continue north to follow the East Trail to the first restroom area, then come back along the opposite riverbank for a very nice walk that’s out in the open. If you continue along the East Trail from the restroom, you’ll have a moderately strenuous walk of about five miles instead of a leisurely two miles, so unless you’re in the mood for some real exercise, make the turnaround. You won’t forget this park near the city of Mission in the Rio Grande Valley. It has become the headquarters of the World Birding Center and is now closed to vehicular traffic, so to get to the trails you must walk about two miles from park headquarters, take the tram or rent a bicycle. The Hawk Tower is not really a tower; it’s an elevated walkway with panoramic views of the surrounding brush country and the adjacent resaca. Many species of hawk migrate through this area, so at the right time of year you might see thousands in a single half-hour from the tower. Show up between the last week in March and the first week in April for the best show. The moderate two-mile trail is a wide walkway through thick colima, mesquite and tepeguaje brush that give you shade and protection from the winds. Along the trail you’ll see many birds, including the noisy chachalaca and beautiful kiskadee. If you catch a glimpse of black fur darting through the brush, you might be one of the lucky few to spot a rare jaguarundi in the wild. The trail also has an observation deck surrounded by river cane that overlooks the Rio Grande and Mexico. Closed Canyon is a fascinating place that will draw you back because it’s different every time you visit. 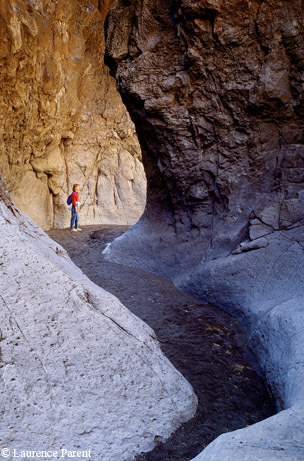 One of the few slot canyons in Texas, it’s located just off the River Road about 20 miles west of Lajitas. The trail follows a dry creek bed from the head of the canyon to the Rio Grande. After parking, look for the big crack in the cliff wall and head for it. The first quarter-mile or so in the canyon is easy going, but then you encounter rocky drops that get steeper the farther in you go. At about 1.5 miles, you cannot continue without climbing equipment. You don’t have to go that far, though, to enjoy the unusual formations — steep cliffs on each side that seem to close in on you as you walk in, large veins of calcite in the cliff faces, cactus growing sideways from solid rock high above you. It’s all quite breathtaking. And remember that the trail is a dry creek bed, so if starts to rain, get out of the canyon quickly or you might be swept away — those cliffs are high and sheer. 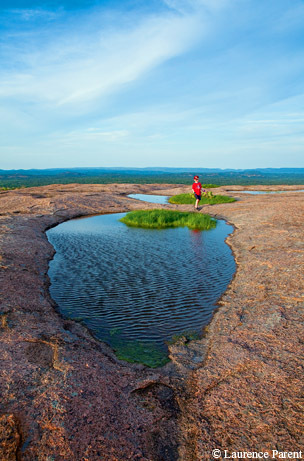 About 18 miles north of Fredericksburg, Enchanted Rock is a pink granite dome 425 feet high and covering 640 acres. The most popular trail at Enchanted Rock SNA goes straight up the face of it — but for some people that’s more of a chore than a walk. A more relaxed and more scenic — but longer — journey to the top starts with the Loop Trail at the end of the campground. Along the way you’ll pass through a couple of different ecosystems — through woods and brush, by a pond, over exposed rock — and you’ll see several unusual rock formations that those who do climb the face of Enchanted Rock never get to see. Follow the Loop Trail to the back side of the main dome, and then walk along the Echo Canyon Trail. Once you’re well into Echo Canyon, it’s a short and steep hike to the top of the dome. Tonkawa Indians gave the rock its name because they believed ghost fires flickered at the top, and they heard strange moaning sounds emanating from the stone. Those sounds can still be heard today at certain times of the night, caused by the rock’s heating by day and contracting in the cool of the evening. The 2.5-mile Lakeside Trail is one fine walk. This isn’t just any walk through the woods — it’s a perfect walk through the woods. The path is smooth and wide with tall trees surrounding it, and while on it, you will feel like you are a part of nature. The moderately hilly trail is mostly a dirt walkway through the piney woods encircling the park’s lake, with boardwalks over some marshy areas. The vegetation and shade are much thicker on the western portion of the walk because the eastern end follows the lake’s beach area. You’ll find benches and picnic tables on the trail, with one particular bench, under the pines overlooking the lake at a strategic point on the western edge, that can offer up blazing views of the setting sun reflecting over the lake. A small portion of the trail follows the park road, so be careful there. You’ll see fish jumping from the lake in the early morning mists, and you can enjoy maple, ash and birch trees turning crimson in the fall. In the summer, go jump in the lake. Take a walk into the heart of the Lost Pines of Texas, just a mile from Bastrop. Begin your two-mile trek at the massive stone gazebo on a hilltop that presents you with breathtaking views of the loblolly pine forest. Then descend the trail into the forest itself. Tall pines dominate the landscape all around, at times giving the feeling of being in a natural cathedral. This is nature at its best. The trail is dirt carpeted with pine needles but is crisscrossed with tree roots, so take care when you’re walking. Several trails cross each other in this area, but the park has provided numerous, color-coded metal blazes on the trees and trail markers to guide you (the Scenic Overlook Trail is red; the Post Oak Spur is gray). The trail is in nearly total shade for its entire length, and a couple of benches allow you to rest during your up-and-down journey. 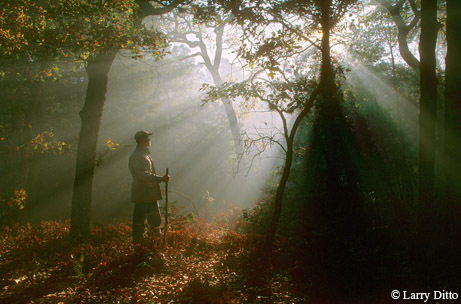 You’ll discover a wildlife viewing blind at one point — a great idea for early mornings and at dusk. These two trails make a loop, with a small portion along Park Road 1A returning you to the parking area. This is a remote park, 28 miles west of Lampasas, with a great payoff: a 60-foot travertine waterfall surrounded by lush vegetation. It’s a beautiful sight. In fact, it’s the single prettiest spot in the Hill Country — one of the best in all of Texas. Be alert along the three-mile round trip and you may spot several endangered bird species that call Colorado Bend home, including the black-capped vireo and golden-cheeked warbler. Look to the sky in cooler months when bald eagles soar. The gravel trail is rocky in many places, wandering up and down small hills, through oak and cedar brakes, and alongside lots of cactus until you get to the base of the falls, where nearly constant moisture has created a chaotic jungle of trees, vines, grasses, ferns, moss and other vegetation. The walk is easy going down until you reach the falls area, where you have to scramble over slick rocks. The park has cable guides strung up to keep you from falling — use them. What makes the walk moderately strenuous in hot weather is the return, when you have to regain all that elevation you lost going down to the river. This park is well off the beaten path near the small town of Moody. This gem of nature was the very first state park in Texas, named for the woman who donated the land, the mother of a Texas governor who helped create our entire Texas park system. What is so nice about this moderately strenuous two-mile walk is that it is almost completely secluded, going through a thick forest and negotiating steep ravines. Start and end this hike at park headquarters, following a series of interconnected trails. Stop for a moment in a ravine and soak in the isolation in this forest primeval. Just when you begin thinking this area historically must have been one of the most primitive and unfrequented areas in Texas, you come upon signs that people have enjoyed it for hundreds and hundreds of years. One indication, in a 40-foot ravine, is the Tonkawa Indian cave that once provided shelter and a burial site. Another is a pond used by pioneer women to wash clothing and used by the Neff family as a swimming hole back in the 19th century. Walk here just once and you’ll be back again and again, just as people have been doing for a thousand years. As they say locally, “Welcome to the Grand Canyon of Texas.” Now, that’s a slight Texas exaggeration because Palo Duro doesn’t have the drama of Arizona’s most famous canyon, but its nearly 30,000 acres are unusual and interesting in their own right. And downright impressive. The Palo Duro canyon system is more than 120 miles long, 20 miles wide and 800 feet deep, located south of Amarillo at the edge of the Llano Estacado. Make sure to take in the scenery at the historic visitors center before heading on down the trail. This strenuous 5.75-mile round-trip walk is worth every drop of sweat since it takes you to the Lighthouse, an extraordinary formation of multihued rock towering over the middle of nowhere. Play peek-a-boo with a lizard sunning on a rock or be startled by a roadrunner zipping by. There’s history here, too, from prehistoric Native Americans to Spanish conquistadors to famous Texas pioneers and soldiers. This is a grand old walk that will take you back in time, figuratively and literally. Some of the rocks you’ll see in the canyon are 250 million years old.